Just who is the OCC and who do they work for? They are the Office of the Comptroller of the Currency, they are a bureau belonging to the Department of the Treasury, and that would make Timmy Geithner, formerly Hank Paulson (former CEO of Goldman Sachs) their boss! However, the head of the OCC is appointed by the President (same guy who appoints the Secretary Treasurer) with the “advise and consent of the Senate” for a 5 year term. Quite ironically, the OCC’s headquarters are located at One Independence Square. …does not receive any appropriations from Congress. Instead, its operations are funded primarily by assessments on national banks. National banks pay for their examinations, and they pay for the OCC's processing of their corporate applications. The OCC also receives revenue from its investment income, primarily from U.S. Treasury securities. Is an agency truly independent when their operating money comes from those who they regulate? • Approve or deny applications for new charters, branches, capital, or other changes in corporate or banking structure. • Take supervisory actions against banks that do not comply with laws and regulations or that otherwise engage in unsound banking practices. The agency can remove officers and directors, negotiate agreements to change banking practices, and issue cease and desist orders as well as civil money penalties. • Issue rules and regulations governing bank investments, lending, and other practices. • To ensure the safety and soundness of the national banking system. • To foster competition by allowing banks to offer new products and services. • To improve the efficiency and effectiveness of OCC supervision, including reducing regulatory burden. • To ensure fair and equal access to financial services for all Americans. I placed a very scientific poll (at least the equal of their work) in the upper right hand corner of this blog. Please take the time to fill it out, perhaps we can all send the results to the central bankers who pay for their own regulator, thank you! Boy, that really distracted me from my mission, to dissect the OCC’s Q1 2009 Quarterly Report which just happens to play down (and attempts to explain away) the risk associated with such tremendously large notional values. But the risk is there and it is concentrated mostly in the top 5 financial institutions. Who are the top 5 and what are the risks? Let’s dive inside the OCC's report and see what we can find! 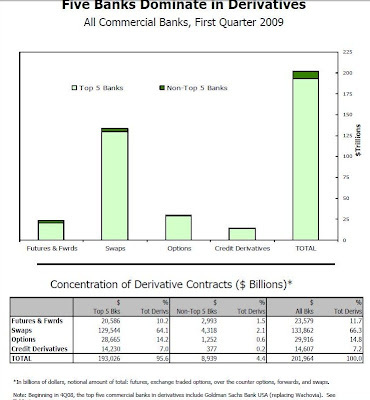 • The notional value of derivatives held by U.S. commercial banks increased $1.6 trillion in the first quarter, or 1%, to $202.0 trillion, due to the continued migration of investment bank derivatives business into the commercial banking system. 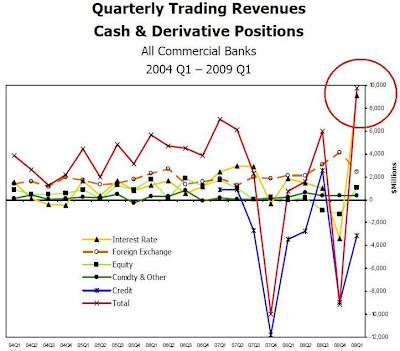 • U.S. commercial banks generated record revenues of $9.8 billion trading cash and derivative instruments in the first quarter of 2009, compared to a $9.2 billion loss in the fourth quarter of 2008. • Net current credit exposure decreased 13% to $695 billion. • Derivative contracts remain concentrated in interest rate products, which comprise 84% of total derivative notional values. The notional value of credit derivative contracts decreased by 8% during the quarter to $14.6 trillion. And, in bullet two we learn that commercial banks generated RECORD REVENUES in Q1 compared to the equal loss in the prior Q4. However, in bullets 3 and 4 we learn that supposed net credit exposure decreased to “only” $695 billion, but that the majority of contracts are interest rate products (CDS) and that they decreased down to a mere $14.6 trillion! Confused? That may well be the point. Let’s jump back into the report and see what’s really going on – as far as we can tell, which I assure you is NOT the entire picture. Hmmm… “the recognition of changes in the value of trading liabilities.” THAT would be marking the value of their debts/ “assets”/ “trading liabilities” to whatever they damn well please. Were the profits of the first two quarters enough to make you angry? Good, those accounting rule changes were brought to you courtesy of the lobbying efforts of the very same banks in which these derivatives are concentrated!! Bank of America alone spent $1.5 BILLION lobbying for these and other changes just this year – not a bad return on that “investment” eh? And it’s surely the gift that keeps on giving. Under the revenue section we learn that CREDIT DERIVATIVES provide the bulk of the profits. 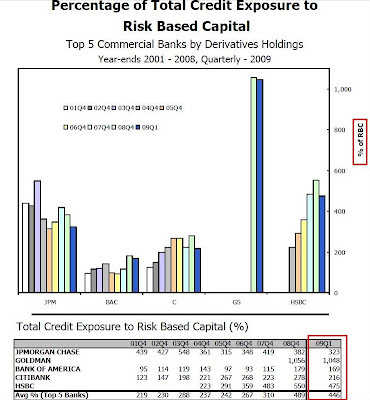 Credit risk is a significant risk in bank derivatives trading activities. The notional amount of a derivative contract is a reference amount from which contractual payments will be derived, but it is generally not an amount at risk. The credit risk in a derivative contract is a function of a number of variables, such as whether counterparties exchange notional principal, the volatility of the underlying market factors (interest rate, currency, commodity, equity or corporate reference entity), the maturity and liquidity of contracts, and the creditworthiness of the counterparties. Credit risk in derivatives differs from credit risk in loans due to the more uncertain nature of the potential credit exposure. 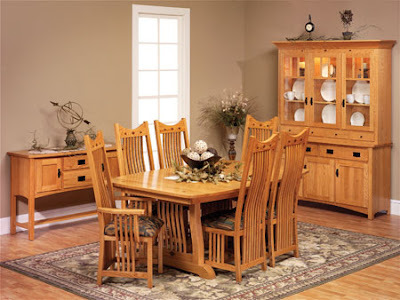 With a funded loan, the amount at risk is the amount advanced to the borrower. The credit risk is unilateral; the bank faces the credit exposure of the borrower. However, in most derivatives transactions, such as swaps (which make up the bulk of bank derivatives contracts), the credit exposure is bilateral. Each party to the contract may (and, if the contract has a long enough tenor, probably will) have a current credit exposure to the other party at various points in time over the contract’s life. Moreover, because the credit exposure is a function of movements in market rates, banks do not know, and can only estimate, how much the value of the derivative contract might be at various points of time in the future. The first step in measuring credit exposure in derivative contracts involves identifying those contracts where a bank would lose value if the counterparty to a contract defaulted today. The total of all contracts with positive value (i.e., derivatives receivables) to the bank is the gross positive fair value (GPFV) and represents an initial measurement of credit exposure. The total of all contracts with negative value (i.e., derivatives payables) to the bank is the gross negative fair value (GNFV) and represents a measurement of the exposure the bank poses to its counterparties. …A bank’s net current credit exposure across all counterparties will therefore be the sum of the gross positive fair values for counterparties lacking legally certain bilateral netting arrangements (this may be due to the use of non-standardized documentation or jurisdiction considerations) and the bilaterally netted current credit exposure for counterparties with legal certainty regarding the enforceability of netting agreements. This “net” current credit exposure is the primary metric used by the OCC to evaluate credit risk in bank derivatives activities. A more risk sensitive measure of credit exposure would also consider the value of collateral held against counterparty exposures. While banks are not required to report collateral held against their derivatives positions in their Call Reports, they do report collateral in their published financial statements. Notably, large trading banks tend to have collateral coverage of 30-40% of their net current credit exposures from derivatives contracts. I do, let me translate… The OCC is not aware of all the contracts or assets backing the contracts, but they are sure it’s all good because the banks report their assets in their financial statements (which are now valued as they wish thanks to the aforementioned expensive FASB and Congressional lobbying efforts). Let’s not even get into “Value at Risk (Var)” because we would soon be getting into a circular valuation argument, one that the financial engineering “geniuses” undoubtedly inserted by design. Question… who is it that prices the value of the swaps the banks “purchased” from one another? Uh huh. Still wondering how the big banks are making billions again while the little guys are going under? Okay, then let me ask you this… what happened between Q4 of 2008 and the end of Q1 2009 that produced this dramatic swing in derivatives earnings from an extreme low to an all time high? Do I need to paint a picture? Okay, we just learned that Bank of America, ALONE, has spent $1.5 BILLION on lobbying so far this year! Meanwhile Congress and the FASB become “convinced” to suspend mark-to-market accounting rules. Valuations? 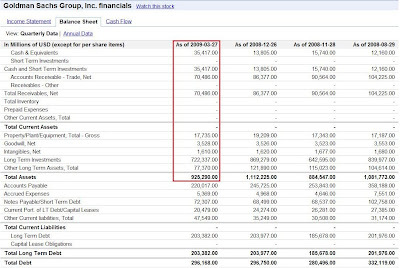 The majority owner of Markit, the company supposedly setting prices in CMBX and other credit derivatives, is none other than Bank of America! Getting the picture? Results? Back to instant and now RECORD derivatives profits! But when it comes to the notional value of derivatives held, the undisputed kind of the world is JPMorgan who possesses a stunning $81 TRILLION in total derivatives, which is DOWN from over $90 trillion just over a year ago! Of the $291 TRILLION that the top 25 holders carry, the top five banks hold nearly $202 trillion, that’s how concentrated they are and how “special” their interests in the shadow banking system are. Note that GMAC is number 12 on this list with $325 billion in derivatives! An “auto” financing company turned subprime financier who blames their ills on their employees/ unions! Yeah, okay, you can buy into the “unions ruined ‘em” line all you want, but I’ll tell you that you need look no further than this report to see exactly why GM is bankrupt. See Honda finance on that list? Didn’t think so. You do see CIT at the bottom, and where are they? BANKRUPT. It’s called stupid leverage! 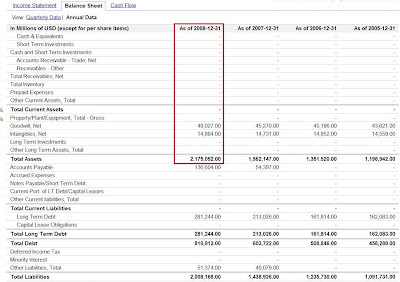 At JPM we find that at the end of ’08 their debt totaled 37.3% of their “assets,” not sterling. But how do they value those “assets” and what are they? They hold a nominal value of derivatives that’s (coincidentally) 37.3 times their listed “assets.” Sure, the OCC will tell you all day long that the notional value isn’t their risk, but what is their true risk? This is where the complete lack of transparency comes in – neither you nor I have any way to know. I have a hunch, though, that when JPM blows up, it’s game over. That’s exactly why they have been dubbed “too big to fail,” and have been allowed to rob our futures blind. And at Goldman their 32% debt to asset ratio isn’t anything near as bad as say an airline, but it’s a tremendous load for a very highly leveraged company otherwise. 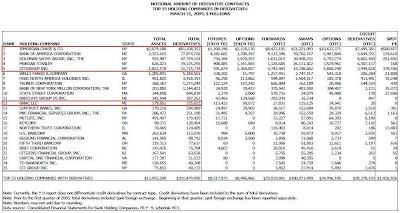 Here we find that their derivative contracts outnumber their total “assets” by a 51.6 to 1 margin, even higher than JPMorgan’s. It is simply astonishing to me that we have allowed these companies to influence our government the way that they have. Our politicians have sold us out, the OCC has failed to do their job, and I would submit that the OCC never had a real job to begin with – their job is to act as if there are checks and balances on the 4th branch of government (the Financial Branch), when in fact there are none! They have bought and paid for the other three! Glass-Steagall, enacted after the Great Depression, was the only limit on leverage there was. The central banks, through tireless lobbying, managed to eliminate it in 1999. Here’s a link chronicling its demise… The Long Demise of Glass-Steagall. It’s now too late to bring back Glass-Steagall, the damage and the amounts of debt in the system are beyond that which future incomes can support. It’s time for radical change, and to me that means eliminating the Fed, taking back control of our money system, and separating all corporations and their money from government. The OCC? No need whatsoever for that Illusion.